What can we say about Donovan other than he has an amazing track record. A medium Fawn PPPeruvian Augusto (recognized as the Herdsire of the Millenium) son with 5Peruvina Durazna (Dark Fawn Female) on the bottom, Donovan continues his legacy in Illinois. We were fortunate enough to purchase Donovan when Magical Farms decided to close their doors fall of 2014. We have already confirmed 3 girls pregnant by Donovan and cannot wait to have these offspring on the ground in our pastures. Although very healthy and robust, there is no guarantee on how many years Donovan will be with us. We are thankful for every year we may get and every offspring we can put in our pastures from him to carry on the genetics of his line. We are offering a very limited number of drive by breedings to him this spring. Right now we have 4 left available.Send us an email for details. Your female is more than welcome to stay for the breeding and we can discuss very reasonable agisting fees while she is here. If you are looking for color and quality, Astrovine is your man! 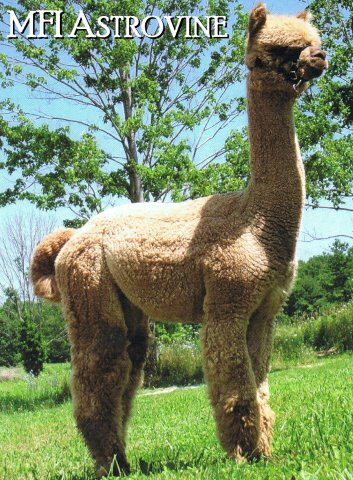 His juvenile fleece won first place and Reserve Color Champion at the 2006 AOBA National Conference amid very tough competition. He followed up with color championships at the Carolina Alpaca Show in February 2007 and the Green Mountain show later that year, in addition to numerous first place ribbons. His sire is MFI Peruvian Donovan, one of Magical's fawn signature herdsires. Donovan is a son of the famous Accoyo Peruvian Augusto. Astrovine has to date about 26 registered offspring in a broad array of colors including rose gray and true black.